Erythrina Lysistemon from the Fabaceae/Legumnosa family (pea/bean family) is also known as Coral tree or Lucky bean tree. Name is derived from the Greek “erythros” meaning red (for flowers and seeds) and Lysistemon being Greek for loose stamen . It is a small to medium sized deciduous tree with a spreading crown and bright red flowers. It is a thick set tree which branches out fairly low down and grows to a height of about 10m.The bark is smooth and dark grey to grey-brown. There are short, hooked prickles scattered on the trunk and branches. Leaves are compound with 3 leaflets. Each leaflet is about 17cm in size. Erythrina blooms between August and September with magnificent flowers before the new leaves show. Flowers are carried in short, dense heads about 9cm long on thick, long stalks. Flowers produce nectar attracting many birds and insects. Fruit is a slender, black pod about 15cm long. While still on the tree the pod will split open releasing the bright red “lucky bean” seeds. Erythrina is found naturally in scrub forests, woodland kloofs, dry woodlands, savannahs, koppies, coastal dune bush and high rainfall areas. It occurs in a wide range of altitudes and habitats from Northwest province to Gauteng, Swaziland to Natal, Eastern Cape to Zimbabwe and Botswana to Angola. Birds and insects feed on the nectar. Vervet monkeys eat the flower buds. Kudu, Klipspringer, Black Rhino and Baboon graze on the leaves. Elephants and Baboons eat the bark. Bush pigs eat the roots. Trees were regarded as royal trees and were planted on graves on Zulu chiefs. Planted as living fences around kraals and waterholes .Wood is light and cork like when dried and has been used to make canoes, rafts and floats for fishing nets as well as troughs. Medicinally, Erythrina has been used as an infusion for easing birth pains during labour. It has also been applied as a poultice to sores, abscesses and arthritis. It does contain a high number of alkaloids known to be highly toxic so caution is advisable. 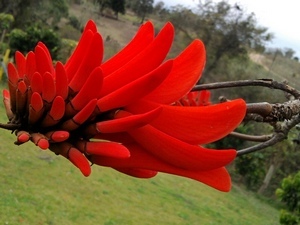 Erythrina is propagated from seed, cuttings and truncheons. Freylinia Tropica comes from the Scrophilariaceae family. It is a shrub with slender, loosely spreading branches. Fairly fast growing it reaches a height of about 2m with a 1m spread. Freylinia flowers profusely with tiny white or blue flowers. It was named after Count L. De Freylino who was the owner of a famous garden at Buttigliera near Marengo, Italy in the early 19th century. Freylinia enjoys semi shade with good well drained soil and plenty of compost. Trimming keeps the shrub neat and encourages bushiness. It is often used as a screening hedge. The quickest way of growing Freylinia is by cuttings. Take cuttings during the growing season and treat with rooting hormone. Root formation can be expected within about 22 days. Crassula Multicava is also known as Fairy Crassula. 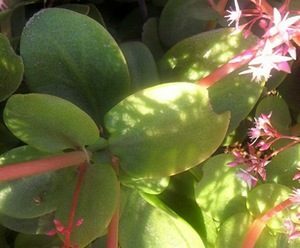 It is a shade loving succulent plant which grows to about 30cm in height. Glossy, oval to round leaves are darker green in shade and lighter in sunnier positions. Flowers are petite star shaped and appear in masses above the leaves. Crassula is found naturally along river banks, forest margins and in coastal thickets from Mpumalanga to KwaZulu/Natal and Southern Cape. Crassula roots easily and spreads from the leaves that fall from the mother plant. In spring bees visit the masses of flowers and the larvae of some butterflies feed on the leaves. Traditionally Crassula is used in an infusion as a strong emetic as well as being sprinkled around the house to prevent lightning strikes. Plants are popular in rock gardens, rocky embankments and hanging baskets. What To Do In The Garden This August. Start planning your spring garden now. It will soon be time to begin planting. Plant new instant lawns and runners now. Weed your lawns before spring growth begins. 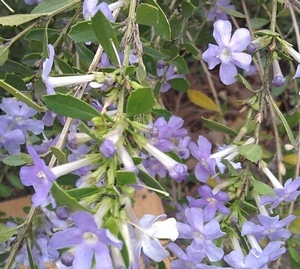 Prune Plumbago, Tecomaria, Solanum, Senecio once they have finished flowering. Give beds a layer of compost and fertiliser and water well.